The State of the Arctic Conference: At the Forefront of Global Change was held 16-19 March 2010 in Miami, Florida. The main goal of the conference was to review understanding of the arctic system in a time of rapid environmental change. Topics ranged from basic understanding of the Arctic and system-wide change to developing response strategies to adapt to and mitigate change. Translating research into solutions—informed solutions to the problems caused by environmental change. Major funding was provided by the National Science Foundation Office of Polar Programs Division of Arctic Sciences, with 17 additional sponsors and partners (see box, below). 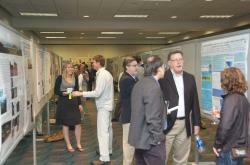 Conference participants discuss research during a poster session. The three main days of the conference included 18 plenary talks, a panel on the science-policy interface, 18 interdisciplinary parallel sessions with 160 talks, and two poster sessions with 220 posters. The fourth day, organized by the International Study of Arctic Change (ISAC), focused on international collaboration and featured 21 talks and a panel discussion. The conference drew 448 on-site participants from 16 countries, including representatives from business, military, and government; non-governmental organizations; research institutions; arctic and native organizations; universities; and K-12 institutions. Approximately 200 additional participants joined via a free webcast. The conference supported a substantial student program with 64 student participants. Twenty-six of those were at least partially supported by scholarship funds provided by the National Oceanic and Atmospheric Administration (NOAA), the Arctic Ocean Sciences Board (AOSB) / International Arctic Science Committee (IASC), and the Cold Regions Research and Engineering Laboratory (CRREL). Student activities included a pre-conference networking webinar, student meeting room, meet and greet breakfast, conversations with scientists luncheon, and a mentoring program with 36 mentor volunteers. Arctic system science is increasingly being conducted in the context of a changing Arctic and in the context of global change. There is now general acceptance that anthropogenic change is overprinted on natural variability. Arctic science is increasingly interdisciplinary and the community is framing research around topics and themes rather than traditional disciplines. Societal needs and solution-oriented research are becoming central drivers for new science programs in the Arctic. The arctic science community is exploring issues of adaptation to and mitigation of change in innovative ways that may lead the way for other regions. The need for stakeholder involvement into the early phases of the design of research programs is apparent. Arctic scientists are exploring new ways of conducting multi-domain, system-scale observations of the arctic system and integrating this knowledge with synthesis and modeling activities. Provide open access to arctic regions and data. Conference organizers solicited participant feedback on the draft resolution. Final publication is expected later this fall. Other products in development include a peer-reviewed paper highlighting key science findings, a document for policymakers summarizing societally-relevant arctic science, special volumes and sets of papers from parallel sessions, and a DVD-compilation of the conference posters. 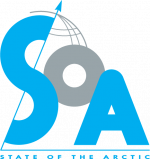 In addition, a variety of archival materials are available online, including plenary and parallel session presentations, abstracts, digital poster files, video of plenary sessions, final attendee list, and conference photos. The conference organizers will announce the availability of additional products as they are finalized and published. For more information on the conference, see the State of the Arctic website: http://soa.arcus.org/ or contact Helen Wiggins at ARCUS (helen [at] arcus.org).